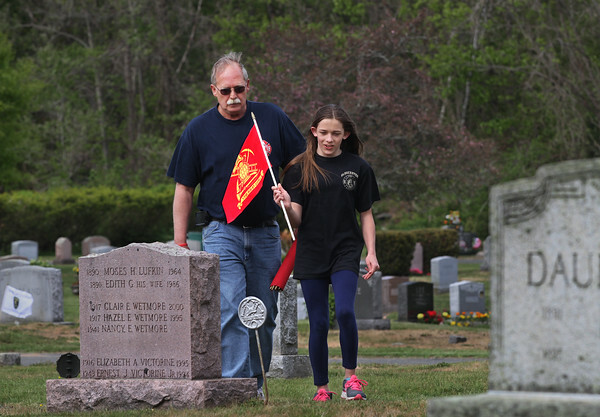 In preparation for Memorial Day, Gloucester firefighter Tim Gallagher and his daughter Shannon, 12, put flags on the graves of firefighters at Beechbrook Cemetery in West Gloucester. A group of Gloucester firefighters place the red flags, with the motto "Loyal To Our Duty," every year on about 100 graves across Cape Ann. Shannon Gallagher has helped her dad place the flags at Beechbrook every year since she was about 5 or 6 years old.